PDM caravan headed by PDM deputy chairman and Parliament Speaker Andrian Candu, visited several villages in Ialoveni district on Tuesday. 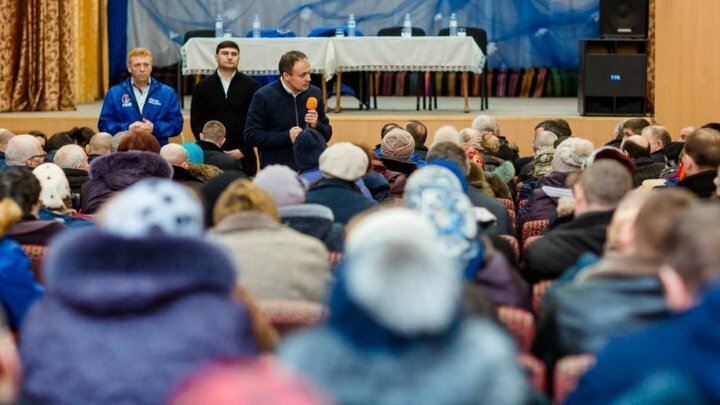 At meetings with residents of Costeşti, Andrian Candu stressed that PDM governance is the only one who can continue the projects started in the last three years for the districts. "You saw the Good Roads Program last year. It was a success - because funds were allocated, the work was done with extensive attention. 1600 km were repaired during 2018. There were localities who never saw good roads and now children are able to walk on new roads. We are going to build more every year. We want to repair 10 000 km in the next four years", declared Andrian Candu. PDM candidate on constituency no.37 Ion Sula also joined the meetings. He discussed with people about projects realized by Democratic governance in district and his proposals for citizens of constituency. "PDM governance renovated schools and kindergartens, repaired roads, brought modern ambulances. In the next years, together with my Democratic colleagues, I pledge to improve district medical situation by renovating offices of family doctors and bringing more new ambulances. People in Ialoveni will have better lives here, at home", said Ion Sula. He confirmed that he will use agricultural expertise to support rural regeneration through rural development projects that integrate agriculture and agro-food industry. "We will help create small local agriculture businesses to use agricultural production properly," the PDM candidate explained. In Răzeni, Andrian Candu talked about supports for farmers. "Human and land are our greatest potentials. PDM came with real supports for farmers. We raised agricultural subsidies to 1 billion lei comparing with under 500 million lei three years ago," confirmed Andrian Candu. The official also mentioned that PDM will support the farmers' request and will propose a change in the subsidy mechanism. "We talked to farmers and many want to apply for subsidies. We will propose farmers will choose to be subsidized per hectare or for investment," added the Democrat. "We started lots of good projects but it's very important to have voters' support. We want to convince you to vote for a team who manage to carry on projects which we started. You can ask the opposition that they will continue or halt raising salaries, pensions, road repairs if they come to power", message of Andrian Candu to the inhabitants of Răzeni.